The face-bow is a mechanical device (fig. 8-15) used to duplicate the position of the maxilla to an articulator. The face-bow rests on the patient's face and a wax bite plate is inserted into the oral cavity to record the patient's bite. Several types of face-bows are available for use. Impression trays hold the impression material in place while it sets. The impression may include a portion of the arch or the entire arch. Generally, the impression tray is shaped to match the natural contour of the arch. The two basic types of trays are stock and custom trays. With either type, the tray used for the mandibular impression differs from the maxillary tray because it allows free tongue movement. Stock trays come in many sizes for both the maxillary and mandibular arches. 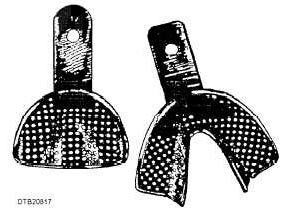 As figures 8-16 and 8-17 illustrate, stock trays may be rimlocking or mesh. Both stock trays are available in regular, edentulous, and orthodontic styles. Generally, the size of a tray will be identified on the handle tray. Figure 8-17. - Maxillary and mandibular mesh stock trays. material flows into the undercuts (ledges) formed by the rim and sets (hardens). This locks the material in the tray. Use liquid tray adhesive or the spray type on impression trays to ensure that the impression material does not separate from the tray. Stock trays are used for hydrocolloid impression materials. Unless disposable, stock trays must be cleaned and sterilized after each patient use. Custom trays are made in the dental laboratory from tray acrylic. Since custom trays are made for individual patients, you must have a dental cast of the patient's teeth. The fabrication of custom trays is discussed later in this chapter. Figure 8-16. - Maxillary and mndibular rimrock stock trays.